The Individual Growing Young Assessment leverages the research done in the Growing Young project to determine six scales by which to measure your church. When you take the Individual Assessment, you complete a survey for immediate results detailing your churchs strongest and weakest areas according to Growing Young research. A 30-page report will be provided immediately upon completion, along with recommended next steps according to your results. Growing Young Assessment from Fuller Youth Institute on Vimeo. 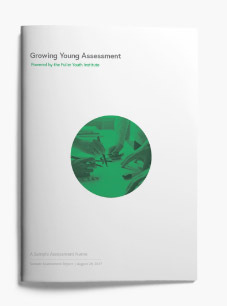 The Growing Young Assessment is an academically-validated survey tool that provides vital insights about your church’s effectiveness with young people. It harnesses the collective insights of your entire congregation to provide you with a true picture of reality.